A police officer looks on as the march gathers at the US Consulate. A member of Black Lives Matter Toronto chants into a megaphone as fellow protesters follow her lead. Torontonians protest carding and show solidarity for Freddie Gray in a march on May 2. Many families also attended the rally. Marchers make their way down University Ave., with Queen's Park just behind them. Marchers make their way down University Ave., with Queen’s Park just behind them. 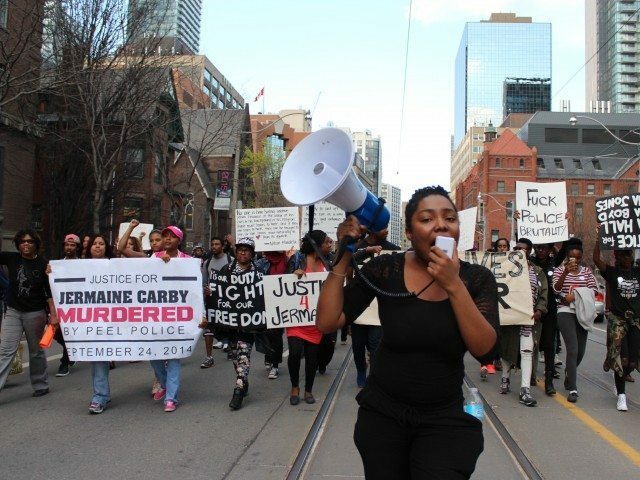 La Tanya Grant attended the rally for her cousin Jermaine Carby, who was fatally shot by Peel police in September. A child holds a sign in memory of her older brother. As hundreds marched down University Avenue in a rally to show solidarity for the death of Baltimore’s Freddie Gray, supporters held signs, exchanged stories, and chanted. Their voices echoed off office buildings and hotels, and people on adjacent sidewalks stopped and stared. The marchers, young and old, were groups of friends, families, colleagues, and people who came on their own. While those at the front were predominantly black, people of various backgrounds were present as they marched towards the U.S. Consulate. There to be heard, marchers took their outrage to American soil, all the while reminding people that here in Toronto, they were hurting too. Organized by the Black Lives Matter Toronto Coalition, the rally started at Toronto Police Headquarters on College Street. It was held to show solidarity with those protesting in Baltimore, and across the U.S., after 25-year-old Freddie Gray died following a spinal cord injury sustained while in police custody in Baltimore. Some wore T-shirts that bore his name, along with the names of other recent high-profile victims of police violence, like Michael Brown, Eric Garner, and Rekia Boyd. But many activists said that police brutality and racial profiling are a prevalent issue in Canada as well. On the steps of 40 College Street, La Tanya Grant spoke about her cousin Jermaine Carby, who was shot dead by Peel police during a traffic stop in September 2014. “My cousin came out of the car to ask why he was pulled over and they shot him four times,” Grant told the crowd. The investigation into the matter is ongoing. In addition to deaths in police custody, Toronto Police Chief Mark Saunders’ support of carding came up often. Desmond Cole, a Torontoist staff writer and community activist, was met with cheers before he addressed the rally. “They have told us, new police chief Mark Saunders told us, that carding was neccessary to do their jobs,” Cole said, gesturing at the police headquarters building behind him. “No!” people shouted in response. Peters was also disappointed with Saunders, Toronto’s first black police chief, and his aversion to ending carding. “I always feel like so much of the political manoeuvring that happens in cities like Toronto are about maintaining white supremacy and racism, while making sure there are enough faces of colour to make it not seem like it’s actually happening,” she said. She did not want to say more, and carried on.